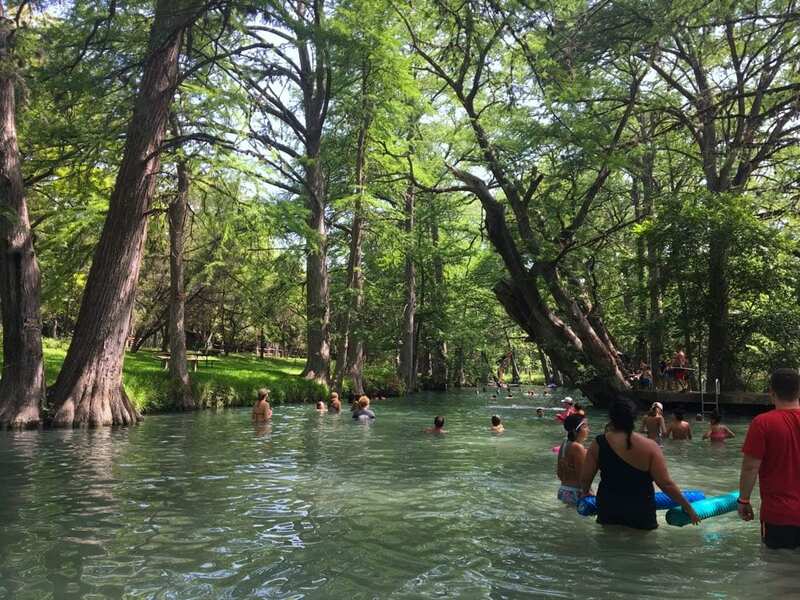 What To Expect: If it’s your first time visiting Blue Hole, take note that this park is easy to visit. Unlike other area swimming holes that require hiking to get to the water, at Blue Hole you’ll find ample parking and short paved pathway in. You’ll simply check in at a front desk and get wristbands for everyone in your group. 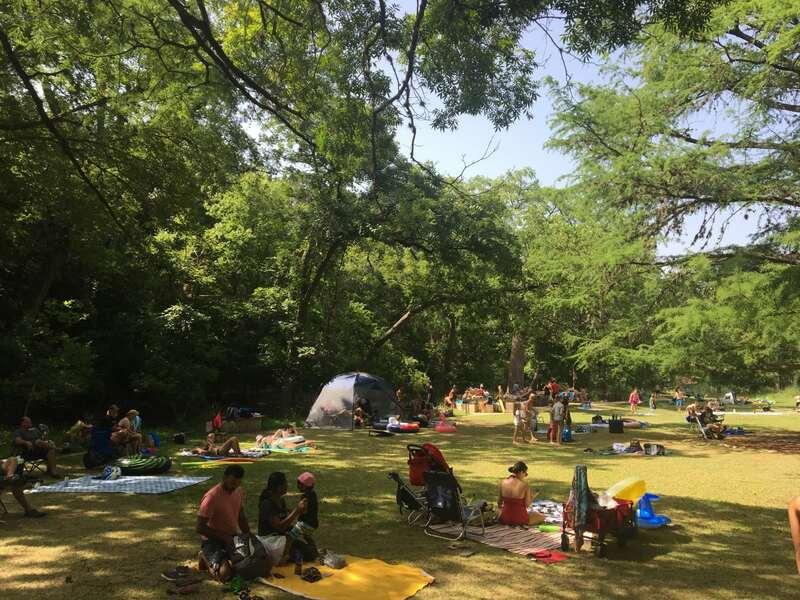 You can take a stop in an actual bathroom with changing space (if needed), then walk right into a big sunny picnic grove to spread out your towels (or even pop-up tents) right next to the cypress creek. The cold water is very shallow on one end, making it easy for younger kids to get in and out. In the deeper areas, you’ll find folks on a variety of floats and inner tubes, and there are ladders to help you get in and out of the water. 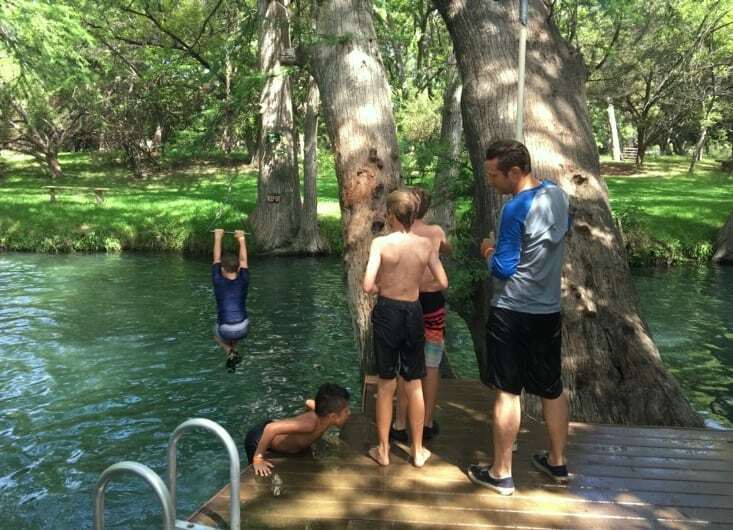 The most exciting feature of Blue Hole is the rope swings! You’ll find the two rope swings: one for kids and one for adults. Nothing beats that feeling of jumping in and making a big splash. There’s a strong community spirit there, too. So even if it’s your first time on a rope swing, folks will encourage you and give you a confidence boost to go for it. Take along some water shoes for the kids since the bottom is rocky & slippery. Bring what you need to set up your “home base” in the grass — blanket, small tent, towels, etc. Camp chairs and 12’x12’ or smaller pop-up shade tents are allowed. 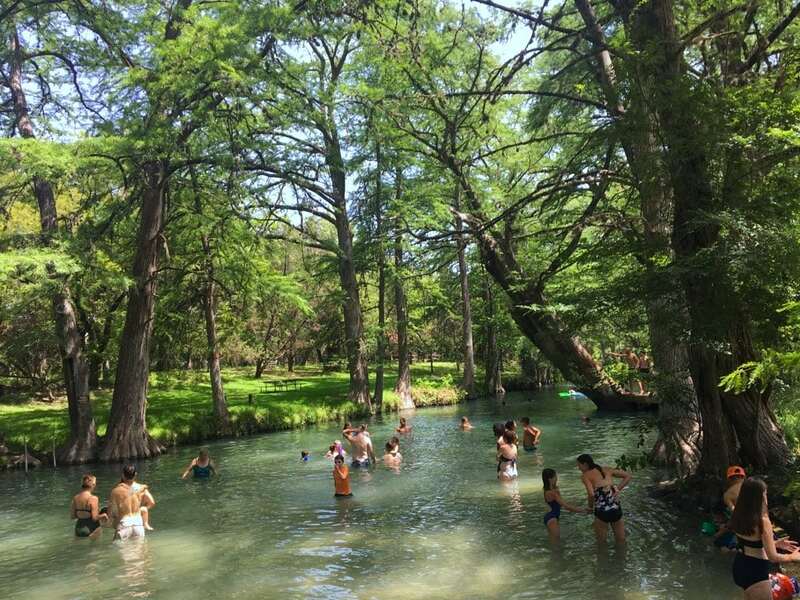 For more info about Blue Hole Regional Park, visit the City of Wimberley website and check out the park’s Facebook page.